Backed by the combined technological prowess of multiple HARMAN brands, the JBL® Commercial Series Mixers (CSM) deliver unsurpassed quality in commercial sound. Easily configured for a range of applications, such as background music, security, and paging, CSM units are designed for everything from schools and hospitals to restaurants and fitness facilities. 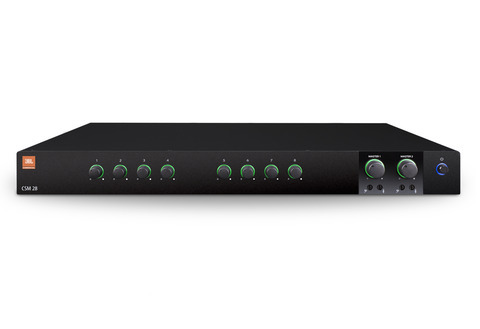 They feature RJ45 connectors for use with JBLCSR-V in-wall volume controls, and a universal power supply that accepts AC voltages from 100 to 240 VAC, 50/60 Hz. Plus, they’re built using HARMAN’s GreenEdge™ clean standards to offer numerous energy-efficient benefits, including a lighter weight, space-saving design, and conforming to RoHS standards.